Typical examples of azonal soils are Fluvisols and Gleysols that occur around watercourses; they are bound to the alluvial part of landscape and have a characteristic spatial manifestation. They are good examples of a strong relationship between landform and soil. Here we wish to verify the efficacy of different relief characteristics derived from a digital terrain model (DTM) for the delineation of hydromorphic soils around small watercourses. The study is focused on choosing the most appropriate terrain attributes and their combinations. The study area consists of a small 83 km2 catchment. A DTM with 10 m by 10 m pixels was derived from contours with a 2 m vertical interval. Three methods were compared: (1) combination of drainage area and slope curvature, (2) compound topographic index (CTI) and (3) combination of drainage area and height above the watercourse. 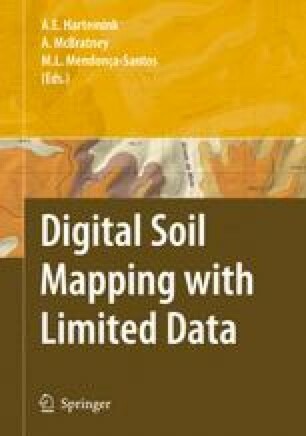 The success of methods was verified by comparison of the width of estimated alluvial soils and alluvial soils extent delineated in detail soil map. Detailed comparison of the maps created showed discontinuities in predicted alluvial plain. The delineation based on compound topographic index provided was the worst. The alluvial plain was strongly underestimated (on average by 43%). Discontinuities of the alluvial plain were very frequent. Steep valley bottoms around smaller watercourses, that cause relatively low CTI values even near the watercourses, are the reason of this failure. The third method that was supported by the assumption that alluvial soil can be present only at some level above the watercourse with consideration of the size of the watercourse was the most successful. The extent of alluvial soils was underestimated by less than 22% and there were no discontinuities in the alluvial plain delineations. This study shows that terrain attributes can be a useful aid for delineation of soils strongly related to terrain.